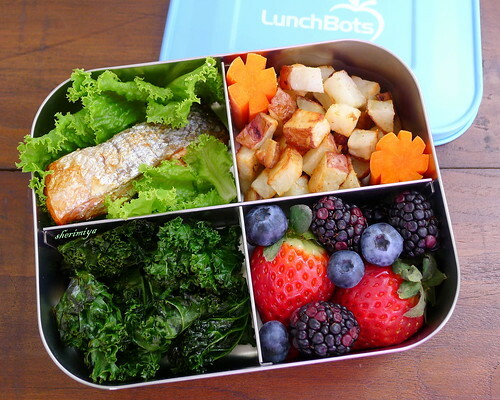 Salmon and Kale Quad Bento, a photo by sherimiya ♥ on Flickr. After more than a week off (Spring Break + a few extra days), I'm back to making bento. It was nice to have the bento break but I did miss connecting with my fellow lunchmaking mom-pals. How are you? I expect some of you also had the week off as well. We were out of town, and an empty fridge makes bentopacking a bit of a challenge. I spent the day replenishing the stock, and I hope I can get back into snappy bentomaking tomorrow. This is actually one I had made a few weeks ago during my trial test period of the LunchBot Quad I reviewed for my giveaway. I didn't post it because I wanted to use it several times before I formulated an opinion on it. If you missed it, I gave it a thumbs-up, and I think I'll be using it a lot for my preschooler. For such a practical box, it's also just so darn cute! Here I packed a piece of broiled salmon in a green lettuce leaf. I had previously been reluctant to use lettuce baran for my daughter because I noticed she wasn't as thrilled about eating it as my son is, and I don't like to waste food. But these were the very end pieces of the lettuce head, so I threw them in. Can you believe she ate them up? I think it must have been the cute box effect. She also loved the roasted potatoes and kale chips. The berry reward was a final delicious topper. This bento was a total hit, and I'm very happy about it. Yay! I am so glad you're back!! miss you and your very inspiring bento posts!!! We haven't starting spring break until next week, can't wait for that and I hope the weather would be great. Welcome back Sheri! Our spring break will start next week. Hope you had a wonderful time with your family! Hope my kids will eat more green veggies! Your kids are awesome! Lucky you Nami! Have a fantastic trip ~ I look forward to hearing all about your Japan adventures! the menu looks delicious .. Welcome back! I missed seeing your beautiful bentos :) Beautiful bento, especially those delicious fruits. Welcome back Sheri! We missed you! I hope you had a super Spring break with the cuties! What a great box. I was wondering how you packed the kale...so the kale chips stay good in a lunch? We always eat it up righ away! :) I hate wasting food too, and my daughter has learned it from me lol! Lyndsey, unfortunately the kale does not stay crisp. I'm not sure how to maintain crispness except via vacuum-packing in hermetically sealed bag (perhaps). Luckily, my kids will still accept the softened version. Thanks! Welcome back Sheri! A quad of delicious cheery and glorious food, as Lilian put it so well--vivid colors and so fresh...delightful!